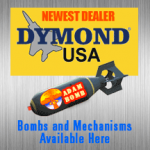 Adam Bombs are available from www.dymondusa.com. They have three versions of the product on their website. Bomb only, Combo, and Mechanism only. They are the Yellow Pages of RC so anything you might need they have including servos to get your Adam Bombs functioning. We use their D27 servos for most applications. Copyright © 2019 DropAdamBomb. All Rights Reserved.